If you’re looking for a decent all-in-one software to manage your Android from your Windows PC then SnapPea is for you. SnapPea for Android allow you to organize your phone contacts, music, photos, videos and apps. SnapPea makes it dead simple by connecting PC to your Phone via USB (you need to enable USB debugging) or Wi-Fi. Warning: Sometimes SnapPea may work better than iTunes. Manage your mobile photos from Desktop using SnapPea. SnapPea allows user to add, delete photos or view them as a Slideshow. You can also download mobile photos to your PC. 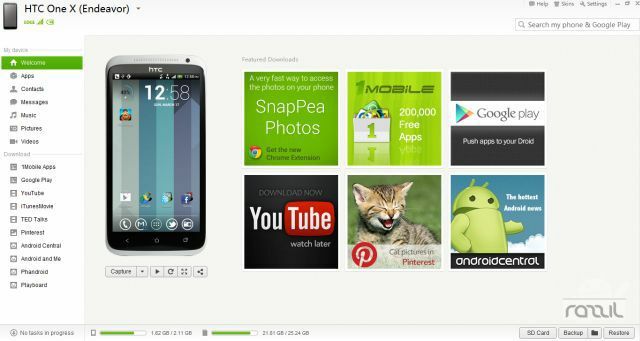 Chrome Extensions of SnapPea provide the fastest way to access the photos on your phone. Export or Delete Videos from your PC. User can also import any new videos from PC to phone. Import, Export or Delete Music from your phone library. User can choose any music in your phone and set as ringtone, notification and alarm. Manage your contacts using SnapPea. Import, Export, Delete, Merge your contacts with one click. You can also add New contact to your phone. SnapPea provides easy solution to manage your clunky contact list. SnapPea gives you full control on your contact list, If you want to manage your Twitter contacts? Don’t worry you can choose which contact to be display or simply add contacts in the Group. In this section, you can Install/Uninstall apps, Export apk to PC, Move apps to SD Card/Internal Storage. Other features, you can save your data plan by downloading apps to the desktop. Another handful features is you can take complete backup/restore of your phone and SnapPea will trigger the backup process whenever you connect your phone. And it also allows you to import iTunes library. Did I forget to mention that you can access your SDCard too? The latest version of SnapPea allows you to manage your Android phone from your browser. No longer requires Software client, just install SnapPea in your phone and head to web.snappea.com. It’s similar like AirDroid. Right now SnapPea is available for Windows only, other users can download SnapPea android app and use it from Browser.